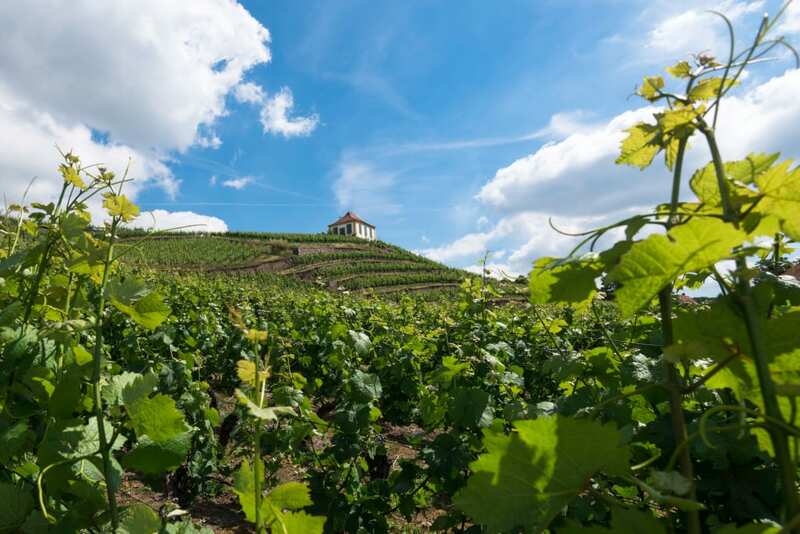 Steep wine terraces, a very special grape variety and wine growing going back to the 11th century – the Saxony wine trail is a treat not just for wine lovers, with enchanting scenery and great festivities over the coming months. For 55 km, the Saxony Wine Trail runs from Pirna via Dresden and Meissen up to Diesbar-Seusslitz through Germany’s easternmost wine-growing regions and one of its smallest. Which makes it perfect for leisurely explorations, taking in the Elbe valley scenery and its unique combination of stately architecture and wine growing with palaces, mansions, old vintner’s houses and vine taverns. The main regional varieties are Pinot Blanc, Pinot Gris, Traminer as well as the very rare Goldriesling which is almost exclusively cultivated in Saxony. 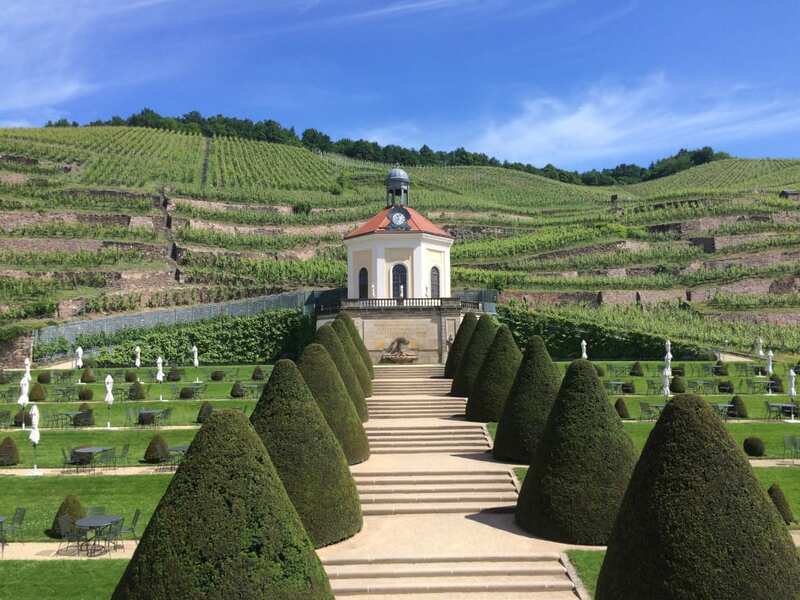 Schloss Wackerbarth, the region’s most famous vineyard, is one of the places to sample the special aroma of the Goldriesling variety that was introduced to Saxony from the Alsace in 1913. Wackerbarth, sitting above the Elbe not far from Dresden, is a quite splendid combination of vineyards, Baroque gardens, a palace and a modern wine and sparkling wine factory. Another name to remember is Hoflössnitz in Radebeul, a listed estate and jewel in Saxony’s wine growing crown. Once a hunting lodge and with a history going back to the 15th century, the historic ensemble features a gorgeous ballroom with vineyard views as well as a wine museum and a “Saxon Wine Route” visitor information centre. Hoflössnitz vineyard, which only produces organic wines, also offers onsite accommodation with four double rooms and two apartments. Schloss Proschwitz is Saxony’s oldest vineyard and also the largest privately-owned one. Run by Georg Prince of Lippe who step by step bought back his family’s estate after the fall of the Wall, Schloss Proschwitz was built in the early 18th century. Its location above the Elbe is hard to beat, with splendid views of Meissen and a great wine shop to sample top quality wines. A long-standing favourite with the locals for a reason: Every year, vineyards between Pillnitz and Diesbar-Seusslitz, in Dresden and the small town of Freital just a few miles south open their doors to visitors who can explore the wine terraces and winemaking on guided tours, before sampling the products. 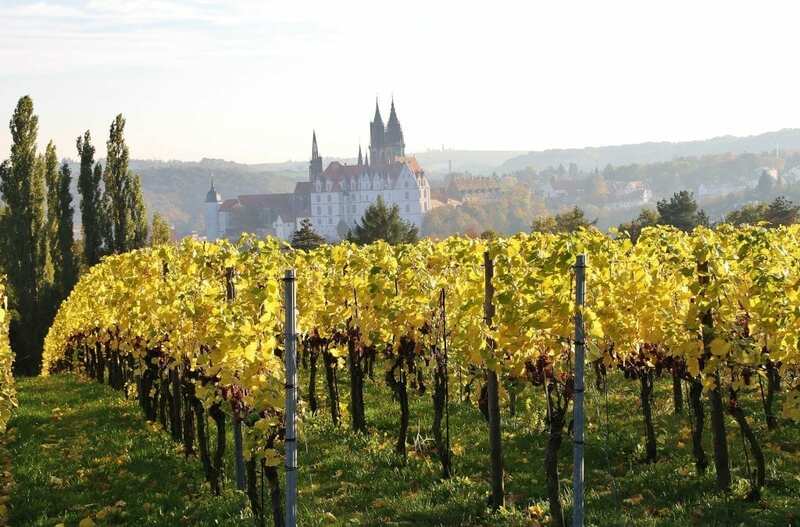 A great way to get to know what makes the Saxony Wine Trail so special. Picturesque Diesbar-Seusslitz in the Dresden Elbland region is the gateway to the Saxon Wine Route. Early autumn is the time for Federweisser, the sweet and low-alcohol wine made of grapes that ripen early, and Diesbar-Seusslitz has quite rightly dedicated a whole wine festival to it. There’s music, guided tours of the surrounding vineyards and lots of delicious savoury snacks that go particularly well with this wine. Don’t be put off by its cloudy look that is down to the yeast that is added to the grapes and its sweetness – it is actually rather refreshing, with a pleasant sparkle. Tip: Take a look at the local Baroque palace and its lovely gardens. For more ideas of what to do in Saxony, read Dresden: Castles, Steam Trains and a Mickey Mouse Republic. Competing with Meissen on the same weekend, Radebeul, about 25 minutes further south, combines wine and performances to great effect: Apart from 30 stands run by winemakers from Saxony and the nearby Saale-Unstrut wine-growing region, wine lovers are treated to anything from pantomime to dance and puppet theatre. Various stages in courtyards and on squares invite visitors to enjoy international artists and vote for their favourite performance. For more information on the Saxony Wine Trail, visit Saxony Tourism: www.visitsaxony.com, part of the Cultural Heart of Germany, www.cultural-heart-of-germany.com, a tourism initiative of Saxony and Thuringia Tourism.